This article is about the Australian supermarket. For other retail establishments of the same name, see Woolworth. Woolworths Limited was founded in September 1924, originally under the name "Wallworths Bazaar Ltd.", a play on the internationally renowned F. W. Woolworth name. After discovering the name had not been registered in Australia, and Woolworths had no plans for overseas expansion, the company became "Woolworths Limited" on 22 September 1924. Following the company's first "Bargain Basement" opening in the Imperial Arcade, on Sydney's Pitt Street, there was little interest in shareholders to accelerate the brand's growth. However, as trading continued and shareholders brought more capital, the dividends paid by the company increased from 5% to 50% after its third year of operation. 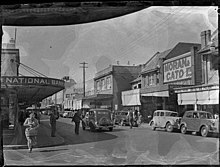 Consumer interest in the company grew after December 1924, as more branches of the store were established across Australia. Woolworths stores began selling a variety of goods, claiming the cheapest prices as well as money back guarantees. At the forefront of innovation in Australia, Woolworths stores became the first variety store in the world to install receipt printing cash register machines in 1926. Nearly twenty years after the company's establishment, Woolworths had a store in every state in Australia, following the opening of their Hobart store in 1940. With the company and its stores doing successfully, Woolworths began to experiment with expanding their grocery range; more stores began stocking fresh fruits and vegetables and a larger range of food. As Woolworths began to gradually transition to becoming exclusively a grocery store, this saw the creation of the first "Big W" store in 1955, the brand's department store counterpart. As of January 2017, approximately 99% of all Woolworths Supermarkets currently use the green apple Woolworths logo. Some suburban stores still use the old logo in Australia. In 2018, Woolworths made a historical decision to ban single-use plastic bags during checkout, along with Coles. It's been reported in the first 3 months following the ban, Australian's plastic bag use dropped by 80%, leading to 1.5 billion fewer bags going to landfill. Melbourne's first newly branded Woolworths and Woolworths Liquor supermarket in Chadstone, Victoria. In 1982, Woolworths acquired two Tasmanian grocery brands: Roelf Vos and Purity, which were converted into Woolworths in 2000. The biggest buyout from Woolworths came in 1985, after American supermarket giant Safeway had amalgamated with an independently owned Victorian supermarket in 1961; establishing the Safeway brand in Australia. Woolworths took over Safeway Australia in 1985, which had stores in Victoria and Queensland. All stores in Queensland were rebranded as Woolworths supermarkets, however the Victorian stores remained trading under the Safeway name. A newly stylised Safeway logo was created to match the Woolworths brand. In 2008, Woolworths launched a new logo for its supermarket division so began phasing out the Safeway name on Victorian stores, rebranding them as Woolworths supermarkets. The entire re-branding process had been calculated to take approximately five years, which was completed in early 2013. However, several stores were still operating as Safeway past the expected completion period. In June 2017, the last remaining Safeway supermarket in Wodonga closed, and was replaced with a new Woolworths store, ending the Safeway brand in Australia after 54 years. In 1987, Woolworths launched their "The Fresh Food People" campaign, the fundamental campaign that existed until 2012, when they slightly modified their long-running slogan with "Australia's Fresh Food People" to more directly identify them as "Aussie". Then they brought the original "The Fresh Food People" slogan back in 2014 along with a new commercial lineup. Loyalty schemes include a number of incentives for purchasing at their stores by subsidising petrol prices at Caltex Woolworths petrol stations and the now defunct Woolworths Plus Petrol. Discounts included 2-cent, 4-cent, 6-cent and in some regional areas 10-cent discounts on fuel when purchases over certain amounts were conducted. As of September 2009, the current offer is a 4 cent/L discount when transactions of over $30 are conducted in-store, with a further 4-cent discount available if customers spend another $5 or more on other items at the petrol site. In September 2007, a trial began in central west New South Wales of Everyday Rewards, a Woolworths shopping card that automatically tracks supermarket purchases and stores fuel discount entitlements, thus eliminating the need for shoppers to retain paper coupons previously used for this purpose. In addition it allows Woolworths to record purchases made by customers to offer them relevant promotions and for studies in demographics and marketing, hence incentives for customers who register their details. This followed Woolworths' announcement that it was planning to launch a general purpose credit card in 2008. Woolworths is expected to offer these credit cardholders reward vouchers redeemable throughout its store network. Woolworths subsequently announced that the Woolworths Everyday Money MasterCard would be launched on 26 August 2008 and allows customers to earn shopping cards redeemable at Woolworths group retailers. In February 2008, Woolworths announced that following the NSW trial, its Everyday Rewards card would be rolled out nationally, beginning with South Australia and Northern Territory in mid-February, and to other states (excluding Tasmania) by the end of May 2008. During the NSW trial, 50,000 cards were issued to customers. Woolworths stated in June 2008 that "well over a million" shoppers had taken a card and registered their details. In August 2008, Woolworths stated that there were 3.8 million cards on issue, with 2.4 million cards registered. From June 2009, Everyday Rewards cardholders were able to earn Qantas Frequent Flyer points, by using their Everyday Rewards cards. Cardholders who had successfully linked their Frequent Flyer card to their registered Everyday Rewards card can earn one Frequent Flyer point for every dollar over $30 that they spent in store. In August 2009, Woolworths announced that there were 3.8 million cards registered, of which 1.2 million were linked to a Qantas Frequent Flyer account. On 26 October 2015 Woolworths announced that, from 1 January 2016, customer loyalty cards would no longer earn Qantas Frequent Flyer points. Instead they will receive more discounts on groceries. The new discount program came into effect on 28 October 2015. Everyday Rewards cardholders will be sent 'Woolworths Rewards' cards. On 31 August 2016, Woolworths announced changes to the existing Woolworths Rewards point collection scheme. The new scheme is for every dollar spent at a Woolworths Supermarket, equals an equivalent 1 Woolworths Dollar. In order for customers to redeem $10, requires the customer to earn approximately 2,000 Woolworths Dollars. The Frequent Shopper Club, or F$C, is a reward program for shopping in Woolworths stores in Tasmania. It was started by Purity Supermarkets in 1992. It is still in use today. The program offers a $20 voucher for every 2000 points accrued. The program offers no online access or signup. As of November 2017, Woolworths launched a basic website for the Frequent Shopper Club. A budget label covering everyday household products and groceries. Easily recognisable due to its plain white and red accented packaging. A premium brand with a range of products including food, shampoo, dog food and potato chips. All products come quality assured. Was previously the self-branded "Woolworths" product line. Woolworths' Gold range must meet two out of their three criteria for them to label the item as a Woolworths' Gold product. A range of products tested against strict criteria and endorsed and approved by Woolworths experts. This range includes products under the names of Emily's Kitchen, Fresh Soups and Yummy Meals. A range of products for families with specific requirements such as gluten free diets, vegetarian foods and organic foods. Salt, sugar and fat levels have been decreased in this range. This range also provides products that are certified organic, which supports biodiversity and nurtures the land. Woolworths used to trade as Safeway in all Victorian locations. From 2008, Safeway branded stores have been progressively branded as Woolworths. The entire re-branding process had been calculated to take approximately five years, ending in early 2013, however some stores still traded under Safeway branding after the expected completion period. In June 2017, the last Safeway store in Wodonga closed down and was converted to a Woolworths, ending the existence of the Safeway brand in Australia after 54 years. Caltex Safeway also operated in Victoria service stations until they converted to Caltex Woolworths from 2010. In Tasmania, Woolworths traded as Roelf Vos and Purity prior to being rebranded as Woolworths in 2000. In New Zealand, Woolworths trades as Countdown. It also operated supermarket brands Foodtown and Woolworths until November 2011, which were rebranded as Countdown. Food For Less is a discount supermarket chain located in Queensland and New South Wales. Flemings is a group of four supermarkets located in Sydney and the Central Coast. There are few of the stores left. Woolworths launched Thomas Dux Grocer in two New South Wales locations in 2008. Thomas Dux Grocer stores have a larger fresh food offering than traditional Woolworths stores, along with a larger delicatessen section. ^ a b "Woolworths Supermarkets". Woolworths Limited. Retrieved 13 August 2017. ^ "Woolworths: Interim result 2015". intelligentinvestor.com.au. 4 March 2015. ^ "Woolworths Group: 2018 Annual Report" (PDF). woolworthsgroup.com.au. ^ Zappone, Chris (9 November 2009). "Supermarket duopoly blamed for soaring food prices". The Sydney Morning Herald. Retrieved 29 July 2013. ^ McGregor, Ken (27 March 2012). "Senator Nick Xenophon moves to smash Coles and Woolworths duopoly". The Advertiser. Retrieved 29 July 2013. ^ Greenblat, Eli (16 July 2013). "Lion boss adjusts to supermarket duopoly". The Age. Retrieved 29 July 2013. ^ "Woolworths Supermarkets". woolworthslimited.com.au. Retrieved 29 June 2015. ^ "Our Story – 1924 September". Woolworths Limited. Retrieved 10 June 2013. ^ "Our Story – 1924 December". Woolworths Limited. Retrieved 10 June 2013. ^ "Our Story – 1926 Printing Cash Registers". Woolworths Limited. Retrieved 10 June 2013. ^ "Our Story – 1940 Woolworths Expands to Tasmania". Woolworths Limited. Retrieved 10 June 2013. ^ "Woolworths brings forward plastic bag ban". SBS News. Retrieved 4 December 2018. ^ "We have saved 1.5 billion plastic bags from landfill". News Mail. Retrieved 4 December 2018. ^ "Gandel and Colonial Open $140 Million Wing of Chadstone Shopping Centre". Retrieved 5 February 2009. ^ "Our Story – 1985 Safeway". Woolworths Limited. Retrieved 10 June 2013. ^ "GDP growth at 0.3% … Kogan has plans for NBN market". Smartcompany. 7 June 2017. Retrieved 8 March 2018. Australia’s last existing “Safeway”-branded Woolworths supermarket has closed its doors, reports ABC, with the Wodonga Plaza Safeway shutting down ahead of a new Woolworths-branded supermarket opening up in the region. ^ "Everyday Rewards Customer Charter". Woolworths Everyday Rewards. Retrieved 23 August 2008. ^ "Now it's Woolworths the credit card people". Sydney Morning Herald. 27 August 2007. Retrieved 6 September 2007. ^ "Woolworths launches new credit card". news.com.au. 18 August 2008. Retrieved 18 August 2008. ^ "Woolies MasterCard debuts in two weeks". The Sheet. 15 August 2008. Archived from the original on 14 August 2008. Retrieved 18 August 2008. ^ "Everyday Rewards terms and conditions". Woolworths. Retrieved 29 January 2009. ^ "Fuel's gold as a million people play cards with Woolworths". Sydney Morning Herald. 5 June 2008. Retrieved 5 June 2008. ^ "Full Year Results Presentation" (PDF). Woolworths Limited. Retrieved 29 August 2008. ^ "Full Year Results Presentation" (PDF). Woolworths Limited. Retrieved 1 March 2016. ^ Croy, Liam (26 October 2015). "Woolies dumps flyer points". The West Australian. Retrieved 30 October 2015 – via au.news.yahoo.com. ... shoppers will no longer earn frequent flyer points on their loyalty cards. Instead, they will earn credits averaging 15 per cent of the price of about 500 products marked with orange tickets at participating Woolworths supermarkets and BWS liquor stores. When the value of the credits reaches $10, customers will receive $10 off their next grocery or liquor bill. ^ "Woolworths Rewards". www.woolworthsrewards.com.au. Retrieved 5 September 2016. ^ "Woolworths Homebrand". Woolworths Supermarkets. Retrieved 19 April 2013. ^ "Woolworths Select". Woolworths Supermarkets. Retrieved 19 April 2013. ^ "Woolworths Fresh". Retrieved 19 April 2013. ^ "Macro Wholefoods Market". Retrieved 19 April 2013. ^ "Woolworths to launch new grocery chain". Inside Retailing. 13 December 2007. Archived from the original on 20 April 2009. Retrieved 19 December 2007. Wikimedia Commons has media related to Woolworths Limited (Australia). This page was last edited on 19 April 2019, at 23:03 (UTC).